Google Street View joins the crab migration on Christmas Island. 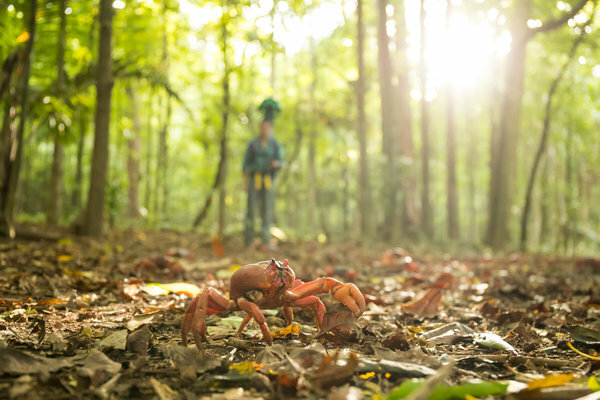 For most of the year, these land crabs stay burrowed in Christmas Island’s lush damp forests to preserve body moisture and protect themselves from harsh sunlight. But each year, they emerge from the forest shelter to march to the sea to spawn near the coastal waters. These bright red residents wait patiently for a precise alignment of the rains, moon cycle and tides to commence their journey. They’re starting to paint the town red and Dr. Alasdair Grigg on behalf of Parks Australia, is carrying the Street View Trekker to collect imagery of this yearly miracle for all to see. The migration concludes on the ocean shores when the highest density of crabs spawn and lay their eggs in the sand – a finale forecasted for December 13. Whether you’re in Ballarat, Bogota or Berlin, soon you’ll be able to experience the Christmas Island crab migration, and its grand finale (the spawning) on Street View. See why Sir David Attenborough calls this phenomenon one of the “most astonishing and wonderful sights.” You can expect to see the imagery from this collection on Street View in early 2018.